A few weeks ago I was asked to make nine dozen cupcakes for an office party where Joe works. I knew it was going to be a challenge, especially since I had little time to prepare. I thought a variety of cupcakes would work best and went to work looking through recipes. 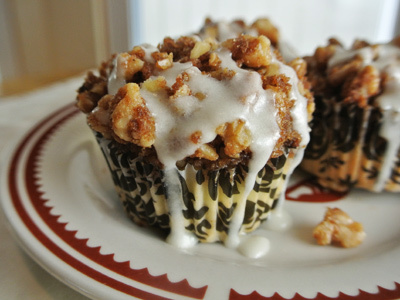 When I found this muffin posted on “A Bountiful Kitchen” I knew it would be a big hit. 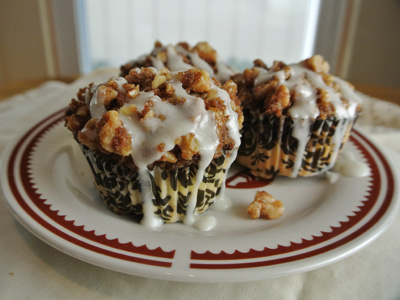 The muffin was so moist inside topped with a crunchy walnut streusel. And the contrast of the salty maple glaze gives your taste buds a real treat. They were so addicting I had to make another batch. I found it easiest to get the streusel mixed together first. You’ll need some brown sugar, melted butter, walnuts, salt and cinnamon. 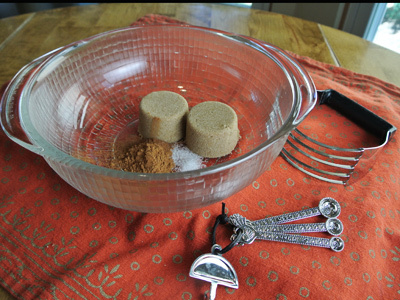 Combine the brown sugar, cinnamon and salt. I mixed it together, than drizzled in the melted butter. 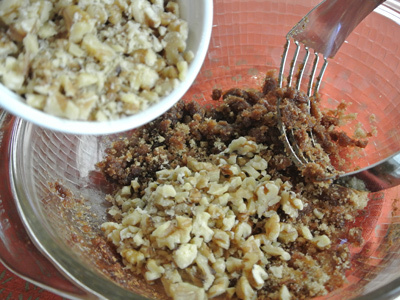 Now comes the crunch, some chopped walnuts. I like to use the pastry cutter to blend it all together, but a fork will do nicely too. Once it’s mixed together, set aside. 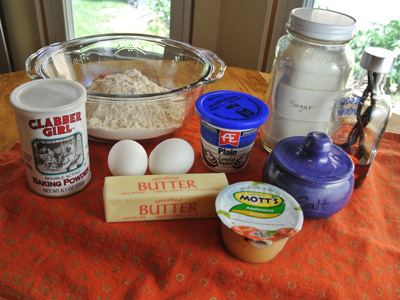 For the cake ingredients, you’ll need some flour, butter, sugar, eggs, salt, baking powder, applesauce, plain Greek yogurt and some vanilla. 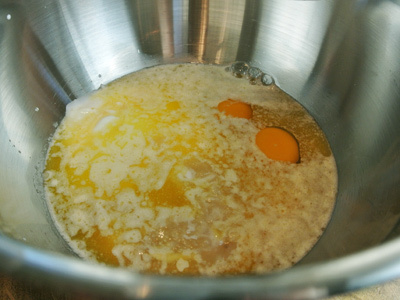 In a mixing bowl, add the melted butter and eggs. Beat until well blended. Mix in the applesauce, Greek yogurt and vanilla. Once it’s blended, begin adding the sugar a bit at a time until it’s dissolved. Combine the flour, salt and baking powder and fold into the mix. Once it’s well incorporated, it’s ready to fill the muffin cups. Fill about 3/4 of the way up. 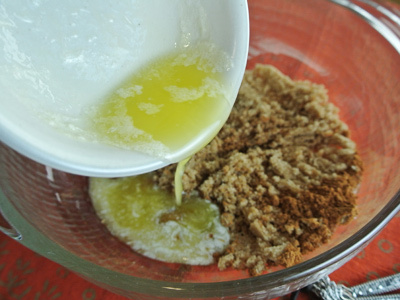 Spoon 1 – 2 tablespoons of streusel over top of the batter. And bake at 325 for 25 – 30 minutes or until toothpick tested. Let cool on a cooling rack before applying the glaze. Didn’t get any photos making the glaze so this will have to do. They were still warm and the glaze just oozed over the sides. Such a contrast between the salty and sweet. 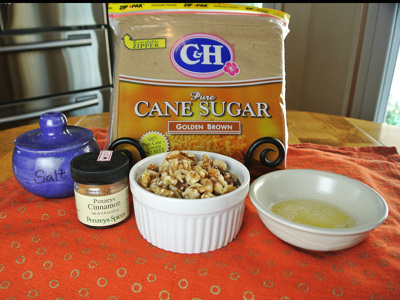 To make the streusel combine the brown sugar, cinnamon and salt with a pastry cutter. Add the melted butter and walnuts. 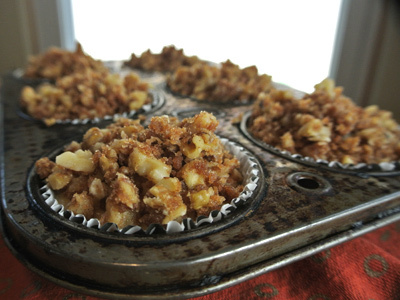 Use the pastry cutter to combine the ingredients until it resembles a coarse crumbly streusel. Set aside. 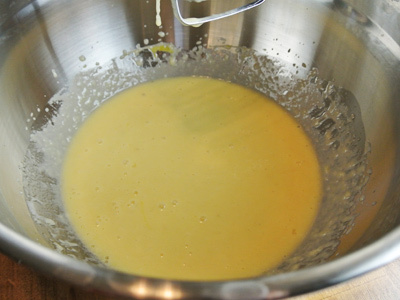 In a medium mixing bowl combine the melted butter and eggs. Beat on medium high speed until well combined. Add in the applesauce, Greek yogurt, and vanilla and beat until blended thoroughly. Stir in the sugar a bit at a time until the sugar has dissolved. You can beat this in or stir by hand. 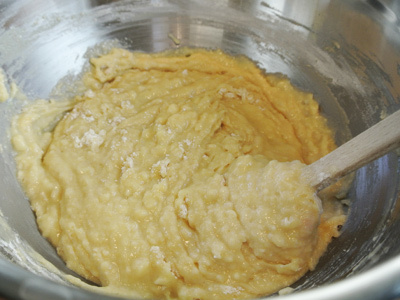 Combine the flour, baking powder and salt and fold into the wet ingredients until incorporated. Fill batter about 3/4 of the way into each paper filled liner. 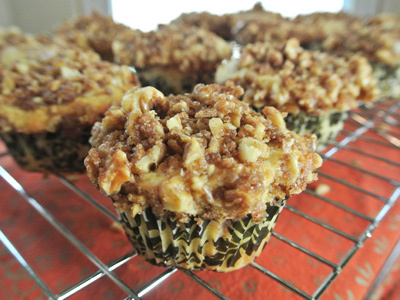 Spoon about 2 tablespoons of streusel mixture over top of each muffin and bake for 25 – 30 minutes. 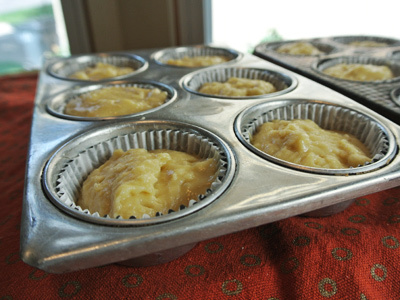 Let muffins cool on a cooling rack before glazing. To make glaze, combine powdered sugar, milk, maple flavoring and melted butter into a bowl and whisk until smooth glaze forms. Add the salt and mix well. Spoon the glaze into a pastry bag or plastic zip lock bag. 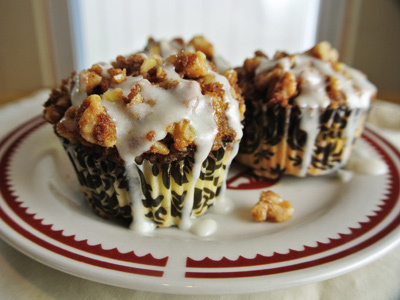 Snip off the end with scissors and drizzle over each cooled muffin. That’s quite a compliment coming from such a fantastic baker! Thanks Anne!